Every now and then I’ll come across a bride who asks us to organise the buttonholes and flowers for the bridal party only because they’ve got a friend or relative taking care of the table centres. Now I understand brides wanting to keep costs down as much possible but unfortunately organising bridal flowers is just not that simple. Wedding flowers must match the bride’s, bridesmaid’s dresses as well as what the groom and groomsmen wear. They also have to match the ceremony and reception setting; in other words, the entire theme of the wedding. I’ve arrived at weddings that were not professionally set up only to see the wrong colour table centres that don’t match and it’s something that everyone notices unfortunately. The other thing is, when dealing with flowers, timing is critical. It’s not about organising them to be set up on the same day, it’s about organising them to be set up at a very specific hour! What happens a lot in these DIY sort of situations is that the friend or relative in charge will set up the table centres in the morning instead of the afternoon because that is when they are attending the wedding. By the time the guests and bridal party arrive for the reception, the flowers have begun to drastically wilt. I’ve had to rip flowers out of table centres before the wedding couple arrive because they would otherwise freak if they saw dead, drooping flowers on every table. This is unfortunately what happens to people when they don’t deal with flowers on a daily basis. If you happen to want to still go down the DIY path, then at least have your florist supply the flowers for you, that way she can have time to professionally nurture them to open to the exact time, then you can still set them up. Funny story. The groom turned up at the venue with his groomsmen to have one of their location shots for one of their getting ready photos. We had already delivered their buttonholes earlier that day but we happened to be at the venue at the same time as we were setting up the table centres. So when they turned up, they had their photos taken and as they went to get in the limo, they did the right thing and all took their buttonholes off to put them back into the fridge to keep them fresh. But they were so nervous when taking them off, one groomsman accidentally dropped one on the road (in his haste to get a beer!) and they started to drive off before rescuing the crushed, wilting buttonhole left baking in the afternoon sun! Luckily I had my car kit with me that’s got all my tapes, wires and magnets and I quickly remade the buttonhole and disaster was averted…just! Because I tell you, if you had seen the original button hole…there was absolutely no way of rescuing that crumpled mess! Here’s a little tip with buttonholes: It’s always a good idea for brides to order two buttonholes for the Groom. What happens is throughout the day, grooms are always hugging and kissing everyone and the groom’s buttonhole tend to become a little disheveled and squashed as a result. By keeping an extra at the reception, once the ceremony and location shots are over, the groom then can replace the old buttonhole with a fresh one and will look great for the rest of the evening. What’s the latest trend sweeping through the bridal industry? In a word…texture! Yep. Twine around bouquet stems instead of satin, hessian table runners replacing mirror bases and even jars and bottles filled with flowers and used as centrepieces are just some of the latest innovations capturing the attention of brides in 2013. The jar and bottle idea is pretty creative actually because brides are using them specifically as little keep-safes for guests at the end of the evening! It seems as though the whole eco-friendly, recycled look is in, especially in event decorations where the hessian and hanging bottle theme is very popular at the moment. I’m even starting to receive more requests for tree like arrangements for table centres where I incorporate twigs and hand wired orchids in tall tapered glass so it’s high enough to be above the visual level. In my last blog A Succulent Summer Trend I mentioned that Succulents had been the trend for many summer brides but now we’re moving into autumn and winter let’s look at some of the emerging floral trends for the coming colder months. As always, Tulips are the perennial winter flower of choice mainly as they’re quite sensitive to heat and tend to open quickly in the summer months whereas in winter they tend not to open as fast making them easier to work with. Now one thing that has struck me, is that brides tend to be very conscious of the seasons these days when it comes to choosing their wedding flower themes. In the summer, brides choose a lot of pinks, yellows and whites but if you look at what they’re choosing now, you’ll see the deeper, richer colours emerging. Berries and dark maroon calla lilies are very popular at the moment and as the surroundings become lush and green, colour choices such as these compliment each other beautifully. Textures are also becoming more prevalent. For example, brides are choosing 2 combinations of foliage with berries and at least 3 diff varieties of flowers, most common being roses and freesias but also alstroneria if girls are on budget. They comes in lots of colours, oranges, pinks, yellow, reds, pales, peaches and are a great filler flower that can be incorporated into most weddings designs. Check out the video below for some examples. 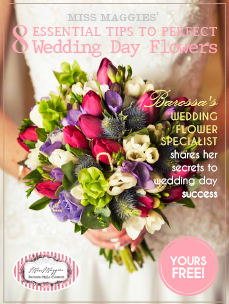 We are pleased to announce our new e-book, 8 Essential Tips to Perfect Wedding Day Flowers is now ready for download! Aside from the tips provided, it contains a montage of beautiful images captured from previous weddings and is designed to give you lots of inspiration for choosing your wedding flowers. You can download it free from our website. Just click the link below, fill in your details and it will be instantly downloadable. Enjoy!